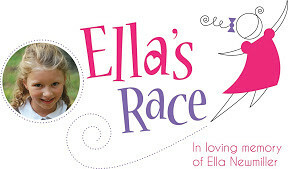 Ella’s Race ~ 5K & 10K and 1 Mile Fun Run Saturday March 19th! Are you looking for a 5K , 10K or 1 mile fun run and want to support a great cause in the process? Well lace up your running shoes for Ella’s Race on Saturday March 19, 2016th. The race is hosted by Chick-fil-A Capital Crossing and Falls Village in North Raleigh and benefits The Cure Starts Now and the Pediatric Brain Tumor Foundation to help pediatric research, aid, and support efforts for children with brain cancer & tumors. The 10K and 5K Race start at 8am and 8:10am respectively. The 1 mile fun run is at 9:00am. The course will take you through some of the nearby neighborhoods in beautiful North Raleigh. Directly beside the finish line of the race will be a FREE Family FunZone for children under 12 years of age. The Family FunZone will be open from 7:00-10:00AM on event day and will be filled with free activities and inflatables! Ella was diagnosed April 29, 2008 with a Diffuse Intrinsic Pontine Glioma. This is a rare, aggressive, non-operable tumor located in the pons area of the brainstem. The prognosis for this type of tumor is extremely grim. There is no cure, no known effective treatment except for radiation-which, for some, provides only temporary relief of the symptoms. Ella lost her brave battle on Wednesday, February 8th while at home with her family. Run. Donate. Support. Proceeds of the Chick-fil-A Connect Race Series of Raleigh help organizations fight for children like Ella. Ella’s supporters believe in the work that The Cure Starts Now and the Pediatric Brain Tumor Foundation do. They are partnering to make this race a reality and to save children diagnosed with cancer and brain tumors. Chance to win FREE Race Registration! Thanks to my friends at Chic-fil-A I have one FREE 5K and 10K race geistration to give away to Triangle Explorer readers! To enter the giveaway just leave a comment below sharing why you like to run and whether you are looking to do the 5K or 10K. One winner will be picked for each race. You can also earn additional entries into the drawing by sharing a link to this post about Ella’s Race on Twitter and/or facebook. Be sure to tag me @Trianglexplorer and use the hashtag #EllasRace so I can see you have shared the link. I will select 2 winners randomly on Wednesday March 9th and notify the winners by email with the promotional codes. Thank you for helping spread the word about this wonderful cause! I like to run 5k’s because not only is it good exercise but they usually benefit a worthy cause! I’ve just recently started running, and I love it because it helps me feel more healthy and also for the sense of accomplishment I get when I finish running. I would love to participate in the 5k. I love to run and enjoy the freedom it provides! I feel healthier and have so much more energy when I run! I would really enjoy running in the 10k race! Thank you for your consideration! I like to run because it helps relieve stress and gives me a few minutes to myself! I can only manage a 5k these days. I’d love to give back one stride of time!!!!!! !